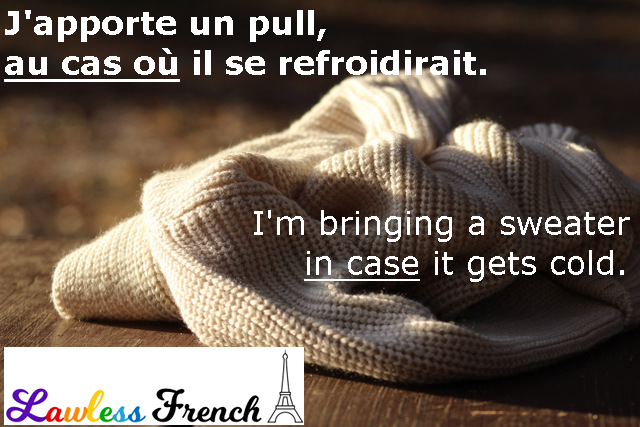 Usage notes: Au cas où is one of those French expressions you need to learn "just in case." (See what I did there?) The normal way to use it is in front of a clause with a verb in the conditional. J’apporte un pull, au cas où il ferait froid. I’m bringing a sweater in case it’s cold out. Au cas où tu dépenserais tout ton argent, je te donne ma carte de crédit. In case you spend all of your money, I’m giving you my credit card. Informally, au cas où is added to the end of a sentence as a sort of filler when the reason doesn’t need to be stated explicitly. J’apporte un pull, au cas où. I’m bringing a sweater, just in case. Je te donne ma carte de crédit au cas où. I’m giving you my credit card, just in case. Does au cas où need the subjunctive? Does au cas où require the subjunctive? J’amènerai un pull au cas où il ferait froid. I’ll bring a sweater in case it’s cold. Au cas où is always followed by the conditional (as is dans le cas où). 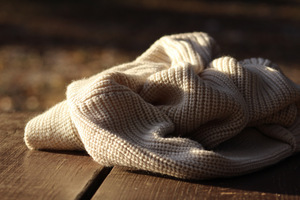 The example “J’apporte un pull, au cas où” given above, should it not be ” J’emporte un pull?” The sweater is inanimate and it is staying with me. Technically yes, you’re right. But in reality, the French tend to use amener in place of apporter, emmener, and emporter.